A total conversion mod that brings back some of the magic of playing Skyrim for the first time. A new adventure that recalls much of the magic of exploring Skyrim, and it's free. Playing Skyrim in November 2011 felt like joining an expedition into the unknown. We were experiencing strange things for the first time and excitedly sharing them. Rumours abounded. Was there really a headless horseman on the roads around Whiterun at night? A giant who mourned over his dead mammoth pal? Hunters bathing in a hot spring in their underwear? The joy of discovery dimmed over time, and another kind of joy replaced it. When I play Skyrim now I do it knowing what can happen there. There are mods to enhance these playthroughs in so many ways, but Enderal, a total conversion years in the making, is a different kind of mod. It's not here to make my Nth new Skyrim adventure better—it's here to wipe the slate and give me back something like the experience of playing it for the first time. We can be explorers again. 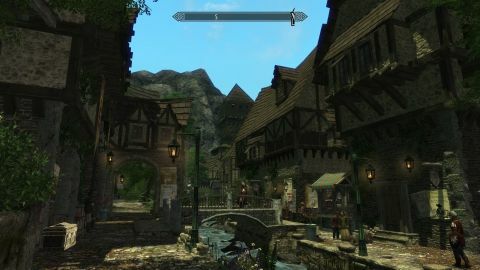 German modding team SureAI have made a country almost as big as Skyrim filled with new quests, dungeons, monsters, and fully voiced English-speaking NPCs (some by professional voice actors). While the starting area is a traditional green heartland full of bandits, wolves, rats, and spiders eventually I find a dangerous jungle and stranger locations like a town built on platforms suspended above a water-filled cavern, or the Whisperwood with its glowing trees and crystal formations. There are mountains and snow as well but it's more obviously varied than Skyrim, even if the suddenness of its geographical changes can be jarring. They've also tweaked some of Skyrim’s fundamentals. Healing’s not as easy, with health only regenerating out of combat when I eat a hearty meal, and only regenerating in combat when I drink potions. Plus, most of the potions found in dungeons are “rancid” and ineffective. Level scaling is gone so I have to pay attention to the difficulty rating of quests, and fast-travel’s been restricted to signposts that take me from one city district to another, giant flying birds for hire, and teleport scrolls to get me back home. It's almost but not quite a whole new game. The sun does this a lot. Show-off. Enderal is a theocracy where citizens worship immortal wizards who set themselves up as gods, and where people are born into castes called Paths. Someone born into the Manufacturer Path is unlikely to ever join the ruling class in the Sublime Path. It's not a place where someone can be the head of every guild at once, and it doesn't have those classic Bethesda faction storylines (no Dark Brotherhood here, sadly). What it does have is a central questline about saving the world that’s a bit Mass Effect (and I mean that as a compliment), surrounded by short sidequests that show off different aspects of the setting. One moment I'm rescuing someone from a goatman, the next collecting rare eggs by following birds back to their nests or hunting bounties found on a bulletin board. But before that I have to go through a long tutorial covering my arrival in Enderal as a Pathless foreigner, the kind of traditional fantasy RPG outsider who needs to have the setting explained to them while being mildly discriminated against. The opening gives me a backstory and deposits me on the beach, but then it stops and starts a couple more times before letting me really cut loose, which is when Enderal gets good. The landscape has plenty of variety, from fields full of flowers to the desolate Powder Desert, all of which it shows off with vistas where the sun edges around an outcrop of jagged stone or a gigantic statue while butterflies or glowbugs dance past. Everything's been carefully placed by hand for maximum effect, including the enemies. Collectibles like red magic symbols worth experience points and blue Ice Claw mushrooms that give a tiny boost to carrying capacity are scattered about to encourage exploration. They’re better motivation to explore than another bloody Nirnroot, but I already want to look around every corner because it's just so pretty. We're not in Skyrim anymore. With no level-scaling in Enderal I need to earn experience points before I'm tough enough to explore everywhere I want to. The ability to level up is oddly part of the plot, my accelerated learning and ability to quickly master magic signs of a strange fever that accompanies being overtaken by destiny. This makes me instrumental in helping the Holy Order of Keepers figure out why the Red Madness is turning people crazy, what the mysterious Cleansing is all about, who the High Ones are—there's a lot of Important Capitalization in Enderal, but once I got a handle on it I do start to care about understanding what’s going on. At the same time I'm also trying to figure out why I'm suffering from this arcane fever and having visions. Casting certain spells or staying in magic-rich areas pushes my arcane fever higher, and it has to be managed with medicine called ambrosia. Though I was never in danger of dying from it I did have to think twice before relying on magic, which is an interesting change. I may be a chosen one, but in Enderal being a chosen one is kind of like having a really bad flu. Time to level up with hallucinatory stones. Experience points are earned through a traditional system, handed out for completing quests, defeating enemies, crafting new items, and so on rather than Skyrim's “learning by doing”. At each level, trees of perks are ready to be unlocked. But unlike Skyrim’s constellations, here they’re carved into standing stones. It’s a cosmetic change and many of the perks are straight out of Skyrim, but some represent new abilities like being able to shoot fire arrows. Some combine well, and the ability to drop flammable oil obviously syncs up with those fire arrows, but it’s a fussy twist of the existing system and lacks thematic unity. It’s nice to earn magical abilities like the one that freezes enemies or stops time, but others should really be equipment. Fire arrows can be found in Enderal and there are already convenient oil slicks everywhere. At each level I also gain points to distribute among skills, most of which correlate directly with Skyrim's. But to spend them I have to buy a book for each point I want to spend, books that evaporate as soon as I read them. Enderal is full of merchants who sell books about pickpocketing and lockpicking for some reason. Almost all of my money goes to these books. When I waste a couple of grand buying and upgrading a house I end up with dozens of unspent points better used on combat skills that might prevent me being murdered by panthers over and over. I see the appeal in having a money-sink but skill books are so essential, and become so much more expensive as skills increase, that buying crafting materials or a house or anything else is a bad idea. It’s a bit too restrictive. While we’re talking about restrictions, Enderal’s quest design can be a railroad, making the less linear missions stand out. In one that really works, the mayor of Riverville's wife is sick but thanks to my visions I realize she's being haunted, and the only way to cure her is to lay the ghost to rest. I travel to the ghost's ruined home, experience some more visions, piece together the clues, and learn who the murderer was. More importantly, I learn their motivation and what the consequences of making this story public will be. Then it's my choice whether to convict them or take their side and cover up what I've learned. Here's an example of the other kind of quest: A merchant has a magical stone I need. His mansion is private and though there appear to be multiple ways in, only one of them works. He quickly kicks me out and I have to sneak back in, this time through one of the other entrances—a locked door I'm suddenly allowed to pick. This time the guards are on alert so it becomes the kind of stealth section where I fail the instant I cross a guard's eyeline. It reloads my last save each time, even when I drink an invisibility potion before being spotted. It's the kind of one-solution slog that enforces playing a specific way instead of embracing what's fun about open-world RPGs: making your own decisions. Enderal bounces between these two things, choice-rich freedom immediately followed by stodgy linearity. Mountains or invisible walls funnel me onto paths when I travel, and companions—likeable ones who change their opinion of me based on how I talk to them—refuse to follow if I leave the road. At times it takes control away entirely, walking me to the right spot for a scripted event or unskippable conversation. Once I was teleported to a door as my companions opened it so I could be caught in the same trap. Still, Enderal's flaws are minor compared to what it achieves. Even though it's crashed on me a bunch of times and some of its decisions are frustrating—I'm not enthusiastic about finding new merchants to buy skill books from and would happily have Skyrim's leveling back—the 50 hours or so I spent finishing the main quest and various bits of side stuff were plenty enjoyable, and there's still more left to do. The standard of writing is high, with dialogue that’s chatty and has none of the fusty formality that sometimes plagues translations. The voice-acting’s also far beyond what you expect from a fan project, aided by a couple of professionals like Dave Fennoy (Lee from The Walking Dead) making cameos. What it's not is a stick to beat Bethesda with. If you're the kind of dissatisfied Elder Scrolls fan looking for an excuse to say “Here's what Skyrim should have been!” this isn't it. In fact, Enderal makes me appreciate Skyrim even more for reminding me of that initial burst of discoveries and letting me experience something like it again. Whether it's a couple of skeletons in strange poses, a collectible in a hard-to-reach spot, a gambler in the tavern, or a buried treasure marked with an X, I keep finding things that remind me I'm in a world that hasn't been catalogued in a wiki yet. Everything feels fresh and each time I crest the top of a hill there's something different on the far side.